The Boeing 707 prototype Model 367-80 or "Dash 80". The Boeing 707 was not the first US transport aircraft to be jet-powered; that distinction belonged to the experimental military XC-123A powered assault glider. However, the 707 was the first production American jet airliner that allowed the US to gain the lead in commercial jet transportation. The 707 remained in continuous production from the mid-1950s until 1977 with more than 1,000 aircraft produced. The 707 prototype, the Model 367-80 or "Dash 80", made its inaugural flight on July 15, 1954. Its main competitor at the time was the British De Havilland Comet, but the 707 had accommodations for approximately four times as many passengers as the original Comet I that had first flown on July 27, 1949—it was also 100 mph faster than the Comet. This, combined with a series of accidents for the Comet, helped establish the 707 in World-Wide service. (One year after the Comet went into service, three aircraft broke up in flight due to metal fatigue. Cracks originating from the window corners caused catastrophic failures.) The Comet 4 was first to open a transatlantic passenger jet service, on October 4, 1958, but this was followed by a Pan American 707 on October 26, 1958 and went on to inaugurate the first round the world jet passenger service on October 10, 1959. Initial orders from the airlines were delayed because they were still flying fairly new piston-powered aircraft that they still needed to recoup their investment from, so the first 29 aircraft were built as KC-13A fuel tankers. It wasn’t long before the airlines started ordering jets and then a flood of orders came from airlines all over the world, after a large order was placed by Pan American. Production centered on two major series, the 707-120 medium-range versions for up to 181 passengers and the 707-320 long-range versions for 189 passengers. When production ended in 1977, a total of 1,011 Boeing 707 airliners were produced and were operating in every continent of the world. The story of the 707 begins with Boeing trying to develop an improved version of the Model 367 that the Air Force was currently using as the C-97. It was then realized that the performance of the C-97 with existing piston engines and the B-29 wing had reached its limits and that a whole new aerodynamic design was needed. Boeing was looking to develop a commercial variant of the B-47, but continued to work through the Model 367 or C-97 development line. The final form was the 80th configuration of the Model 367 and so designated as the Model 367-80. Boeing kept this designation as to not tip off its competitors. Word had a way of getting around in the industry and the 367-80 designation would give the allusion that it was just a further development of the C-97. 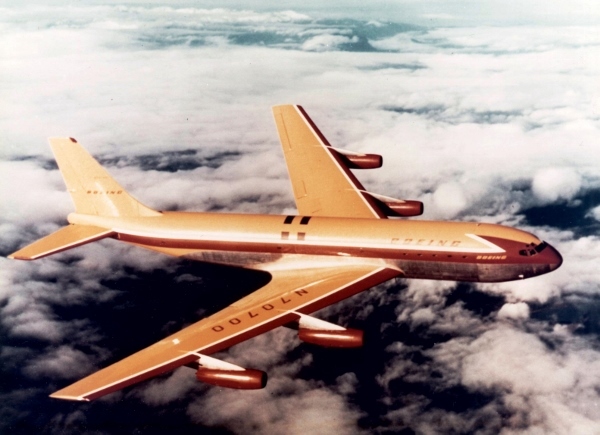 It wasn’t until the aircraft was unveiled that Boeing designated it as the Model 707. The fuselage of the 707 had the same width as the C-97, but the sides were smoothed out and did not have the pronounced crease. The length of the tubular fuselage remained straight so that sections could be added for increased capacity. The wings and engine pylons were variants of the B-47 and B-52 but were more rigid with pronounced dihedral built in. Panels could be added at the wing roots to increase wing span. A distinctive feature of the 707 was the High Frequency (HF) boom antenna pointing forward at the top of the vertical stabilizer. The horizontal stabilizer also had a pronounced dihedral. There were two sets of ailerons, inboard and outboard. With the flaps down, both sets of ailerons would operate. With the flaps retracted, only the inboard ailerons would be operated during cruise to dampen lateral control. Spoilers would also function for lateral control and as speed brakes. The flaps were located between the engines so as to not obstruct the jet exhaust. An early Boeing 707 with JT4 engines, equipped with sound suppressors. The HF antenna on top of the vertical stabilizer was a distinctive feature of the 707. 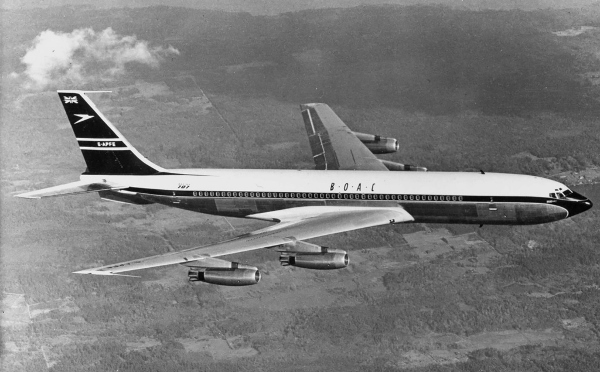 The original Boeing 707 was followed by a series of 707 passenger and cargo variants, with different lengths, weights and engines. The passenger carrying 707-320B and passenger/cargo 707-320C models were still in production in 1977. Also developed was the short-to-medium-range version known as the Boeing 720 or the 720B with JT3D turbofans. By the end of October 1976, they had flown more than 30 million hours and carried just under 522 million passengers. In 1970 it was still not unusual for passengers to disembark on the airport ramp. The first production airplane of the Boeing 707 commercial jet series made its maiden flight December 20, 1957, with Pan American World Airways putting the airplane into transoceanic service October 26, 1958, and American Airlines following with transcontinental service January 25, 1959. The prototype jet airliner, built as a private venture by Boeing at a cost of more than $16,000,000, amassed more than 1000 hours in its four years of flight testing, while the first three of the production airplanes used for Civil Aeronautics Administration certification testing raised the overall total to more than 1650 hours. In addition, the new jet transports benefited by the thousands of hours of flight time logged by their military counterpart, the Boeing KC-135 jet multipurpose tanker-transports which went into service in 1957. Including the prototype, there are eight Boeing jet airliners; the others are the 707-120, the 707-120B, the 707-220, the 707-320, the 707-420, the 720 and the 720B. Weighing in at 248,000 pounds as compared with the prototype's 190,000, the 120 is principally intended for continental use. The 220 is identical in airframe and body size to the 120, but is powered by Pratt & Whitney JT4 turbojet engines, larger and of greater thrust than the JT3. The "B" airplanes use Pratt & Whitney JT3D turbofan engines. SPECIFICATIONS (120): Span 130 ft. 10 in. ; Height 42 ft.; Length 144 ft. 6 in. ; Engines Four Pratt & Whitney JT3C-6 turbojet, more than 10,000 lb. thrust; Gear tricycle, main undercarriage units, four-wheel trucks, dual nose wheels. PERFORMANCE: Cruise Speed 591 mph; Cruising Altitude 25,000 to 40,000 ft. The 320 and the 420 are the Intercontinental 707s, which partially fulfill the growth potential Boeing designed into the basic 707 series. Weighing more than 295,000 pounds, they are 8 feet, 5 inches longer overall than the 120, 220, and 720, have 11 feet 7 inches more wingspan, and 500 square feet of additional wing area. Fuselage diameter, 148 inches, is the same in all models. Only difference between the 320 and 420 is the engines, the former using Pratt & Whitney JT4s and the latter Rolls-Royce "Conways." SPECIFICATIONS INTERCONTINENTAL: Span 142 ft. 5 in. ; Height 42 ft.; Length 152 ft. 11 in. ; Engines Four Pratt & Whitney JT4 or Rolls Royce Conway turbojets, more than 10,000 Lb, thrust; Gear tricycle, main undercarriage units, four-wheel trucks, dual nose wheels. Designed to operate profitably in the medium range area, the Boeing 720 combines low cost with excellent operational flexibility. Associated with its capability to operate over existing route segments is the ability of the 720 to utilize present runways and terminal facilities throughout the entire airline system. The 720 offers a high level of safety, ease of maintenance and inspection, long life, minimum structural weight and reliability based on experience and extensive test programs. The seats are mounted on continuous tracks recessed in the floor, allowing use of four, five and six-abreast seating. In less than ten minutes each row of seats and its accompanying overhead service unit can be repositioned or replaced. Windows are spaced at 20-inch intervals to insure an unobstructed view regardless of seat spacing. This flexibility permits a choice of seating combinations ranging from the luxurious four-abreast interior to the six-abreast, 149-passenger tourist arrangement. SPECIFICATIONS: Span 130 ft. 10 in; Length 136ft. 2 in. ; Height 41 ft. 6.5 in. ; Empty Weight 103,145 Lb. ; Engines Four Pratt & Whitney JT3C-7; Fuel Capacity 11,500 gal. ; Wing Area 2433 sq. ft. PERFORMANCE: Maximum Speed more than 600 mph; Maximum Range 3300 mi. ; Cruising Altitude 15,000 to 40,000 ft.
1. Peter M. Bowers. Boeing Aircraft Since 1916 New York: Funk & Wagnalls, 1968. 352. Created November 27, 2001. Updated October 15, 2013.